Shortly after his brain cancer diagnosis, Senator John McCain hiked through Arizona’s Oak Creek Canyon with his daughter Meghan and two of his closest friends -– Senator Lindsey Graham and former Senator Joe Lieberman. 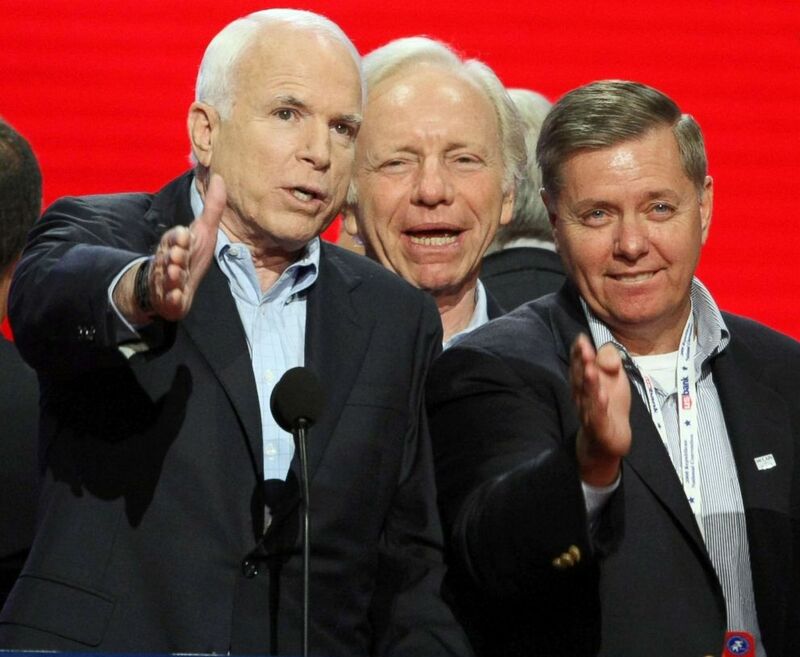 “The three amigos together again!” McCain tweeted at the time. One year later, the bipartisan trio known as the “Three Amigos” is now missing its driving force. 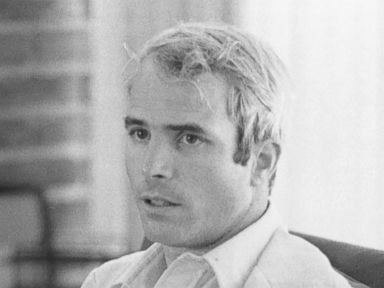 McCain, 81, died Saturday evening. “McCain was the central figure, really, of the three of us,” Lieberman told ABC News in a recent interview. John McCain checks out the podium angles, along with Sen. Joseph Lieberman (center) and Sen. Lindsey Graham (R-SC), before the start of the Republican National Convention at the Xcel Energy Center in St. Paul, Minn., Sept. 4, 2008. Over his time in the Senate, McCain formed a close working relationship with Lieberman, an independent from Connecticut, and Graham, the longtime Republican from South Carolina. They staked their claim as prominent hawkish voices on foreign policy, an issue that took them on travels around the globe and led to the cultivation of a long-lasting friendship that lasted beyond the halls of the Senate. McCain and Lieberman, then a Democrat, met in the Senate in the late 1980’s, telling each other during an encounter on the Senate floor that they hoped to work together in the future. In the 1990’s, the two senators found themselves sharing the same views on the Bosnian war and traveling to the annual Munich Security Conference. 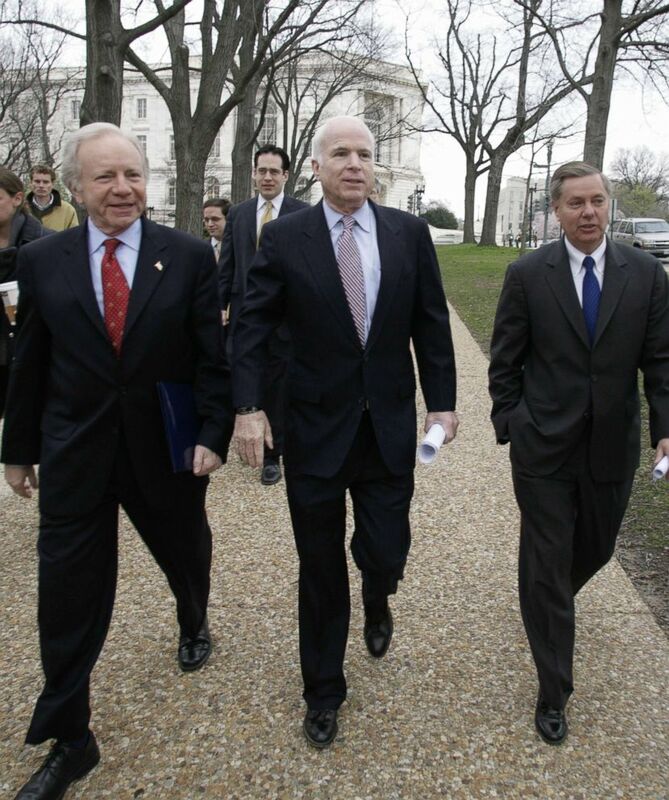 Senator John McCain (C) arrives with US Sen. Joe Lieberman (I-CT) and Sen. Lindsey Graham(R) R-SC at a Vets for Freedom rally on Capitol Hill, April 8, 2008. When Graham became a senator in 2003, he joined the duo. After the 9/11 attacks, the trio made routine visits to Afghanistan and Iraq. It was on one of those trips when General David H. Petraeus gave the nickname to the triumvirate, which became vocal proponents of President George W. Bush’s “surge” strategy in Iraq. As he reflected on their friendship, Lieberman recounted a trip he took with McCain to a Syrian refugee camp in Turkey. “As we got closer we realized they were ... actually cheering and chanting our name, and the one that they chanted most was McCain, of course, because he had really made so clear, and they had known it, that his sympathies were with both the opposition but also with the refugees,” Lieberman said.